At least, I could have. 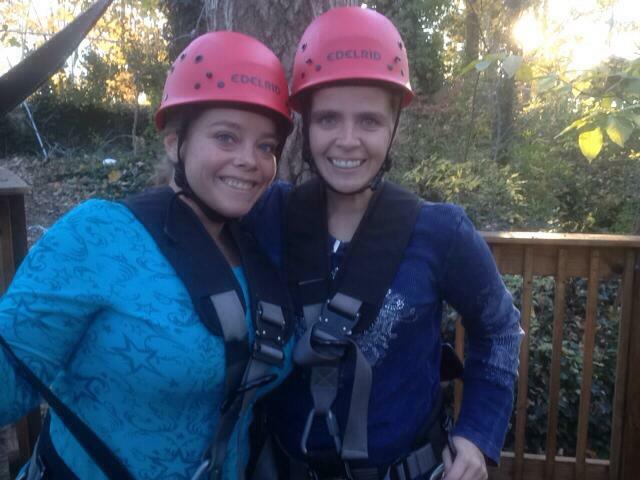 See, my sister and I went rappelling and ziplining today. This was an all-day adventure. We drove two hours to Horse Cave, KY, where we then explored a cave followed by ziplining and concluding with rappelling from an 80 foot drop. There were tons of things I thoroughly enjoyed about this trip. For one, the drive. I love driving. And road trips do not feel me with dread or reluctance; actually, driving is a release. I think when I drive. I came up with my oldest daughter’s name while driving. Characters talk to me when I drive. And, most importantly, I sing and music makes me “heart-happy.” It always has, and probably always will. I don’t sing well but, rather than cause me embarrassment, that gives me the freedom to simply enjoy it. So the idea of driving two hours to engage in physically demanding activities only to turn around and drive home doesn’t scare me; it’s a happy kind of idea. Especially on a day like today. The sky was crystal blue and colors so vibrant they seemed to sing from every direction captivated me and made the drive that much more lovely. Bright yellow and orange trees, with a few red ones thrown in, ran parallel to the highway and reminded me of the lesson we had in school with my Kindergartners this morning about how God created such an amazing and beautiful world. Growing up, being outside never filled me with a sense of awe. 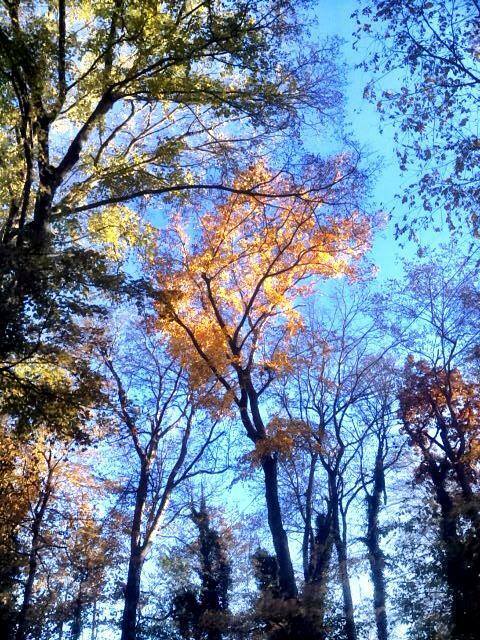 I don’t remember the beauty of the outdoors ever catching me unawares or making me want to stop and soak it all in. But these day every time I go outside, I find multiple new reasons to be hopeful and grateful. The idea of spending time outside during such beautiful weather left me happy. Mostly, though, I looked forward to and was excited about this trip because my sister was going with me. She’d wanted to go rappelling for a long time and so, for her September birthday, I purchased her this Groupon but schedules didn’t allow it until today. I love my sister. But it’s more than that: I admire who she is as a person, and I respect her more than just about anyone else I know. Any positive adjectives I know could be used to describe her; indeed, I used to hope I could one day become her. One of the reasons I so love spending time with Mandi is because we laugh a lot, and we think a lot alike. So we sang together in the car, and talked about how she is about to graduate Nursing School in December. We talked about how tedious and hard the work has been and about how she’s interviewing for positions at St. Thomas and Baptist. I told her a little about the new book I’m (slowly) working on. All in all, it was a fun drive. When we got there, the first part of the day was an exploration into a cave. That was fun, and we learned a lot. Then, on to ziplining. My girls have a zipline in our backyard and we’ve all gone ziplining on longer and higher lines multiple times before. So this didn’t scare or phase me at all. In fact, I really enjoyed ziplining. 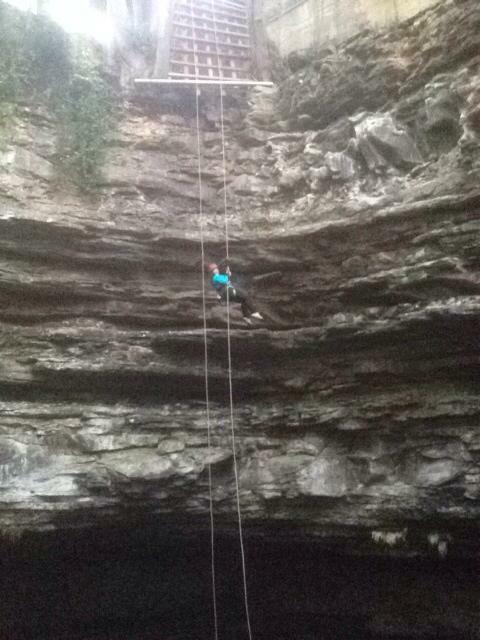 After that, it was time to rappel off of an 80 foot drop. Mandi, naturally, being the adventurous, thrill-seeking gal she is, has rappelled before. And, just for the record, I am not typically adventurous. 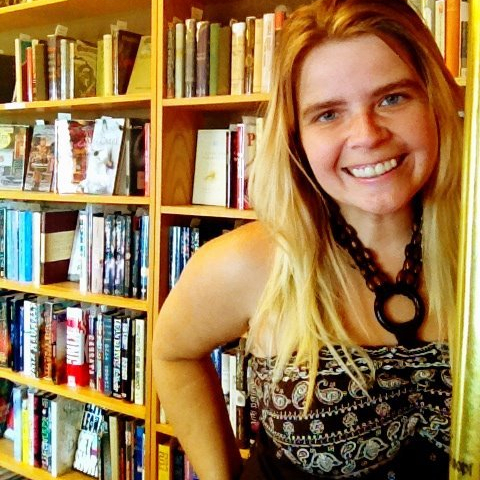 I’m more of a symphony, night-at-the-opera, let’s-go-on-a-date-to-the-local-bookstore girl. You know, the boring kind. I like to be in control and it is hard to find that comforting assurance of control when you are doing something crazy….. like walking off the side of a cliff, which, in case you don’t know, is basically what rappelling is. Also, it is really hard to really scare me. I get spooked all the time when my girls’ safety is even remotely compromised. But, when it’s me, I plunge right in. Show no fear, have no fear is a motto that could describe my attitude. I haven’t been really afraid in a long time. In fact, truthfully, it’s hard for me to feel anything strongly. I laugh, I play, I teach and, at night, when the rest of North America is sleeping, I spend the nighttime hours writing, then soaking resulting tears away in hot bubble baths. I plan, I research, I cook. But it’s been a long time—–a really, really long time—-since I’ve felt any emotion forcefully. I’ve kind of flat-lined, to tell you the truth, and have been holding steady in the contentment that comes from years of feeling safe. Be that as it may, however, while I stood in line, watching others rappel before me, cords of sharp fear wrapped around my heart. Strangely, I wasn’t really afraid of falling 80 feet to my death; I was more afraid that I would mess up and, in so doing, slam my body face first into the unforgiving rock. 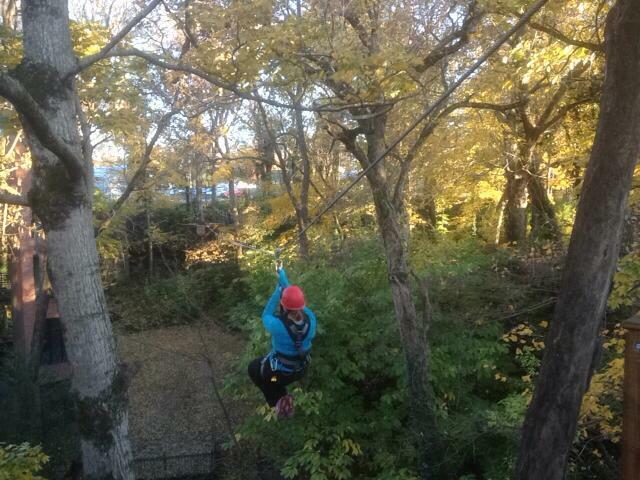 I was more afraid of me than the harness or rope failing. Perhaps that is why ziplining didn’t faze me a bit. Standing in line, though, I kept looking at the cliff, of which I was going to have to walk backwards off, and getting secretly more and more nervous. There’s that over-used word again. I’ll be fine. The guide told me to keep my legs straight, my eyes on my feet and to lean as far back as I could at all times. Then he said, “Do not ever let go of the rope. Ever.” Then, with a smile, he said, “Off you go.” He told me to feed the rope a little, then take a step backwards. I did, and the thing is, I did pretty well. I didn’t faceplant into the side of the cliff. The guide kept commenting on what a “beautiful!” job I was doing. Yes. I’m really, really good at obeying. Despite his reassurances, I did not feel safe at all. I was pretty sure the next big breeze was going to side swing me into that dreaded cliff’s face. The really ironic and funny part is, when I got over the “lip” and could not longer reach the cliff to “walk” down it and was, in essence, “falling”, the fear went away, and I loved it. I like sliding down a rope. I wasn’t scared then. Only when I was trying to rappel down the cliff side was I scared spit less. Scared to the point where I was literally holding my breath and having to consciously remind myself to exhale every few minutes. When I touched the ground, I wasn’t particularly proud of myself, I was just grateful to be alive. Then I watched my sister rappel effortlessly down the eighty feet and listened as she started making plans for us to rappel down the three hundred and fifty foot drop at Red River Gorge. It wasn’t until we got back in the car that I started thinking about how scared I’d been. And something really weird happened as I drove home. 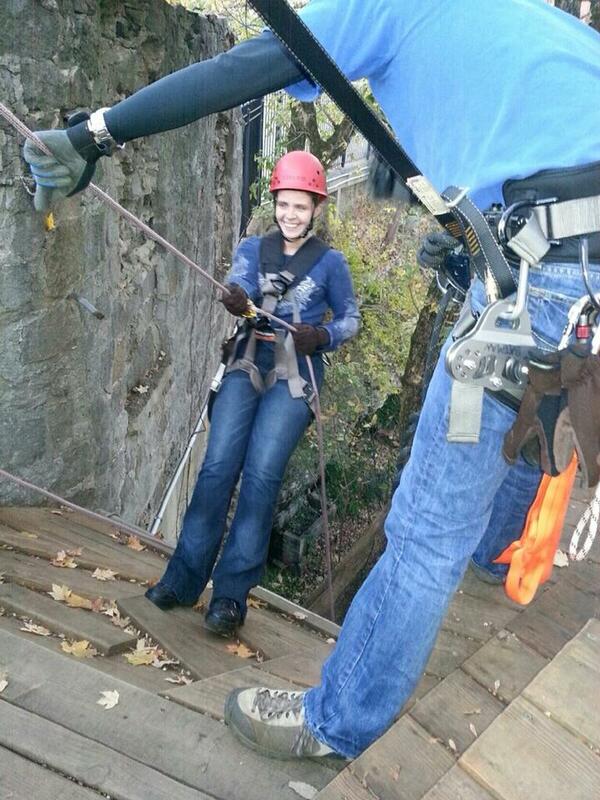 I wasn’t proud of myself for rappelling…. I was grateful to have felt scared. Feeling things—-anything—-is a blessing, a gift. You can become numbed almost effortlessly. You can block emotion from really touching you. I’m rather an expert at this. It’s how I have survived my entire life. There have been one or two notable exceptions to this rule but, for the most part, when something bad happens to me, I shrug it off. I’m fine, and move on. Sadness or fear or joy has to be earned—-if an event isn’t big enough, isn’t life-altering enough, then it doesn’t earn the right to claim such powerful emotions as fear or sadness or joy. Being afraid of the dark isn’t a real fear; turn a light on and go to bed, don’t think about why the dark scares a grown-up. Feeling alone is ridiculous when there are energetic children who clamor for your undivided attention all day, every day: write a blog post or a book and ignore the whys. Feeling happy that your hard work has sold well this month is really quite small in the grand scheme of things and does not therefore earn such a feeling as pride or joy. Spending half an hour catching and then naming a ladybug, however, offers the chance to learn you can find solace in nature, which is a lesson that could offer lifelong comfort; it, therefore, is worthy of the emotion joy. Laughing until your sides hurt during Tickle Fest reminds you to make your priorities more meaningful, so it, too, earns the emotions peace and joy. My point is…..I’ve done an exceptional job of reigning in emotions…. to the point that feeling anything is noteworthy and cause for reflection. I learned a few things from rappelling. Remember how I said that what I feared the most wasn’t falling to my death? Actually, the time spent falling, not walking down the rock face, but just lowering myself to the ground, was my favorite part of rappelling. I have no trouble being suspended in mid-air, regardless of height. It’s why ziplining doesn’t bother me. My fear stemmed from self-doubt. I was afraid of making a mistake. It was just me on that cliff. There was no “tandem” guide, telling me exactly where to place my foot. And I was scared that I would lean too far back, or not lean back far enough. I was worried that I would miss a footing. I was worried that my grip would loosen too much around the rope; what if I forgot and let go completely?? I was scared that I would do something that would cause my body to spin, which would then make my head connect with a sharp-edged rock. I was afraid of me. I didn’t trust myself at all. I know I had a guy belaying me and the guide on top watched the entire time. Furthermore, as he said, I was “always attached” to the harness and rope. I was completely safe. I know that intellectually, and I knew it then, too. But it felt like the smallest incorrect move would mean very bad news for me. Really, though, I did fine. I fed the rope just the right amount, I made sure my legs were straight and I took small steps. Despite the fact that fear encroached on my consciousness to the point where I couldn’t breathe properly for the first time in nearly two years, I didn’t sway or spin once. I kept my calm, even smiling for the cameras and talking about the weather just prior to walking off the cliff. And that reminded me that I am capable of more than I think I am. It taught me, while I’m no expert, I can be trusted…. trusted to obey, trusted to listen, trusted to work hard. It also reminded me that allowing myself to really feel isn’t a bad thing. Without granting myself permission to feel, I can’t expect to grow. You always hear the sayings about how you should “conquer your fear.” Today, I learned that doing that exact thing you didn’t think you could do, conquering your fear, frees you from a self-imposed cage built with walls of insecurity and self-derision. People say that the ability to laugh at yourself is a good thing and, to an extent, it is. But you can laugh at yourself until you become your greatest bully. You can laugh at yourself until you begin to believe you can’t do or enjoy things others can. Which, of course, is false: there are inspiring stories every day of people who accomplish the unthinkable. Mind over matter can really keep you from experiencing life. If you accept the scripts you tell yourself, how can you ever hope to achieve the dreams you have stored away? Only by challenging…. yourself…. can you learn to be awed instead of afraid of obstacles. When I teach my daughters a new concept, I don’t give them the answer right away…. I make them work to figure it out for themselves because that enables the growth of self; it allows them to believe that they are capable of figuring the answer out on their own. Likewise, confronting fear instead of optioning out, inspires the desire to do and grow more. It teaches self-esteem. Mandi rappelling. Doesn’t it look scary?! While I enjoyed ziplining and exploring the cave, I remember far more about the rappelling aspect of our trip. While I enjoyed ziplining, I can’t tell you much about the scenery. But I can tell you every nuance in color among the rocks I rappelled down. In my mind, I can see each foot landing, and how my hands shook from the ropeburn upon my descent. Rappelling is the most vivid, colorful part of our trip. Because that’s when, for a moment, the walls crumbled and emotion found its way in. Because, for a moment, I was too busy living instead of merely wishing. Today in service, my pastor said, “Are we passive or active recipients of grace?” The same could be said of life in general. Are we passive or active recipients of life? We can transform ourselves into robots who merely allow people, events, emotions to run over us or we can accept what is given to us by doing something about it. Today, I was an active recipient… I chose to confront the fear and emerged awed. 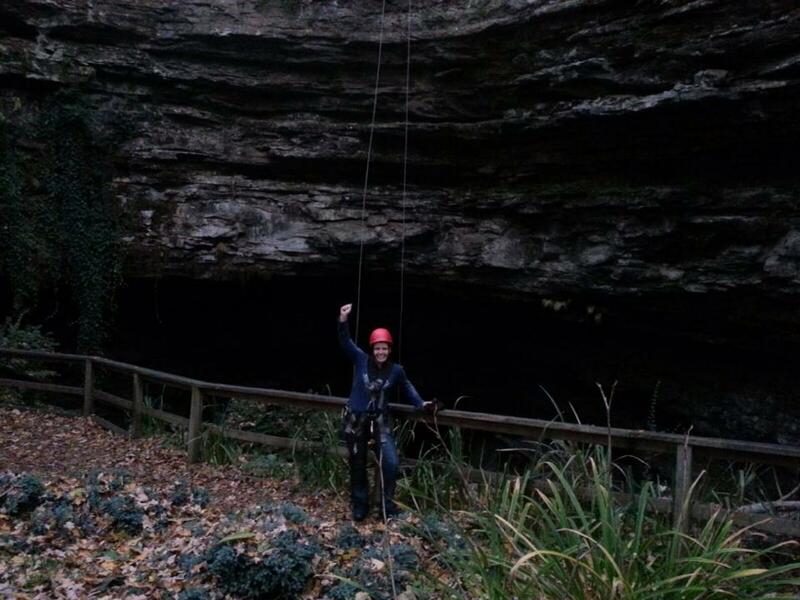 After all, I did rappel down an 80 foot drop.